Hydrangeas have great good showing ability, bloom in lots of colors and are very easy to grow (tips for growing hydrangeas). Learn how to propagate Hydrangeas from cuttings, layering and root division methods by easy-to-follow instructions. Hydrangeas are very easy to root from stem cutting, layering and root division methods. Basically the steps for propagating hydrangeas are similar to propagate blueberries, rose propagation, propagating curry leaf plant and propagate Arabian jasmine. Several years ago, I planted my first hydrangea from a stem cutting. Based on my experience, I give below the following tips for successfully rooting a hydrangeas from cuttings. Winter or early spring is the best time for propagating hydrangeas for home gardeners. At this time the hydrangeas blooms will die and you can take cuttings only from the stems which have not bloomed. Fill the pot with equal parts of potting mix and sand or vermiculite and water it thoroughly and allow to drain. Insert a pencil size stick in the pot at the center to 1 inch above the bottom. Keep aside. How To Take Hydrangea Cutting: Select a semi-hard stem which has not flowered this year. In the morning take a cutting about 5-6 inch long with 3-4 set of leaves with sharp scissors or pruning shears. Remove the lower 2 sets of leaves and the top tip of the cutting. Cut all the leaves to about half their size. Dip cutting in rooting hormone. Insert a pencil thick stick in the soil, remove it and insert (do not push) the prepared cutting into the soil. I did not use any rooting hormone and still I was successful in rooting the cuttings. Place the pot in a polythene bag and close it on top and keep in shade. DO NOT water again for 8-10 days until top soil begins to feel slightly dry. New leaves will begin to emerge in 3-4 weeks depending on temperature. You can see roots coming out at the bottom or if you feel that the cutting is resisting a slight pull, it is rooting. Transfer the plant to a bigger container. The best time for toot division is when your hydrangeas are dormant. Tap the pot at many places all-round to make the roots lose. carefully take out the plant. If the original plant is in ground, then dig up as much of the root ball as possible and remove the plant from ground. Divide the plants by carefully separating the roots and plant them in new pots. Water well and keep the pots in shade. If you want to grow the new plants in ground then select an area that receives sun only in morning. Water regularly. 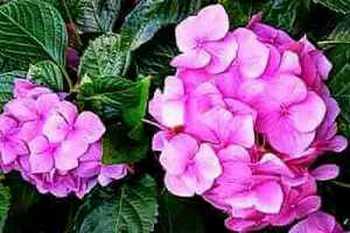 Select a lower branch on a hydrangea bush and push down, cover one or two nodes with soil and put a small weight so that the branch remains in the soil. Water the plant to keep the soil damp at all times. In a few weeks time, the branch will develop new growth. Cut the rooted branch and plant it in a pot.